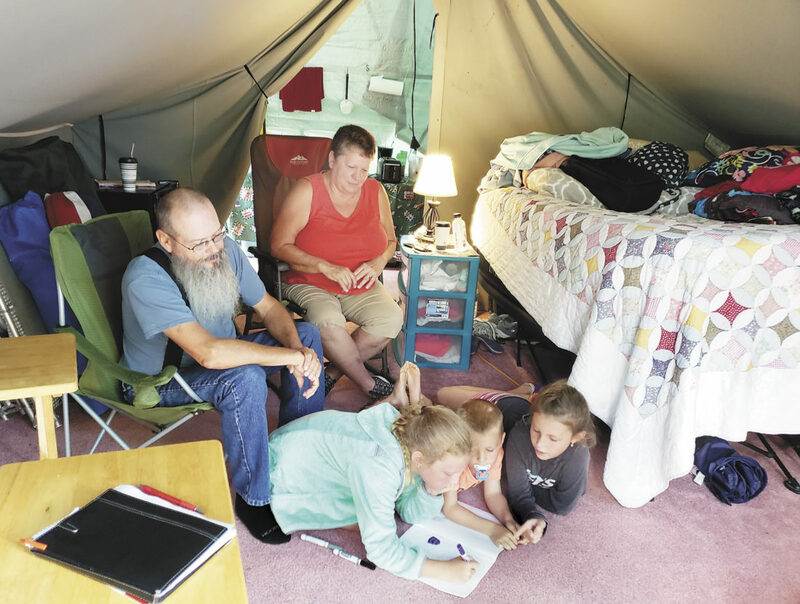 CENTRE HALL–This year, Sandra Stott, of Granville, marks six generations participating in an annual, family tradition: tenting at the Centre County Grange Fair. “I love knowing that it’s there every year,” said Stott. Stott started tenting as a little girl in the 1930s and remembers when there were white tents with wooden floors, rather than the traditional green-army tents with macadam. She also fondly remembers playing at the playground and not-so-fondly seeing one of the animal barns burn down. Stott said her favorite fair food is fried vegetables, washing it down with an Agues milkshake, though she always loved eating at “Aunt Minnie’s” when she was little. Her grandparents got her started with the tradition of tenting, as they themselves were not only annual tenters but had Shank’s restaurant on the grounds for approximately nine years, run by her grandpa Arthur and grandma Minnie. In fact, Stott said the tradition literally spanned her grandmother’s life. “We think a blood clot hit her heart,” Stott said. Stott said Minnie had a stroke prior to her last year at the fair but insisted on going over anyway, with the doctor’s blessing. Minnie spent her last moments of life relaxing at the family tent. Stott’s mother, Renna Mayes, ran Shank’s from 1961 to 1966, before finally shutting it down. Eventually, Stott married and started taking her own son and daughter to tent and enjoy the tradition. Sunny Murphy, Stott’s daughter, said her favorite part is the tradition itself. Murphy enjoys the Gluten-Free Chicken-Bacon-Ranch pizza and has her own fond and not-so-fond memories. Ten years ago, when moving in to the tent, they found someone else’s things inside. Assuming their next-door neighbor miscounted, they moved the stuff over and set up. Later in the day, the neighbor shows up and informs them that the stuff was not theirs. Eventually, Murphy said, they learned another tenter down the row had miscounted from the wrong direction and all was made right. Murphy also remarked on the creative decorations her fellow tenters deck out. One year she recalled a detailed Frozen theme, another year she saw an Under the Sea theme and even recalls seeing the inside of another tent decorated like the interior of a house, with a staircase and all. Murphy said she encourages those unfamiliar with the fair to go because of the tent metropolis. “It’s a little city unto it’s own,” Murphy said. The most memorable moment for Murphy was going into labor with her daughter, Miranda. Now 35 years old, Miranda has also made tenting and fair-going a yearly tradition, since the age of 10-months-old. In 2011, she camped over with her niece and sister during Hurricane Irene. That hasn’t thwarted her interest, however. “I like camping at the tent,” Miranda said, whose favorite food is also fried vegetables, especially the onion rings. Michael Adams, of McVeytown, has been tenting at the Fair for 35 years, five generations between two family locations. His aunt, Mary Trutt, of Lewistown, started coming five years before Adams and used to work the exit-side of Gate #2. Trutt enjoys playing bingo, eating Miller’s Hoagie and sugar waffles and listening to the rain hit the tent at night. “I love living in a tent,” Trutt said. Trutt also enjoys watching entertainment, such as the Hager Brothers, Big Tiny Young and Hypnotist Michael Blaine. Trutt said people should come to the fair because of the food, the exhibits and the unique tent decorating. The more memorable moments for Adams and his wife, Ethel, are when it has rained at the fair, which they say it often does. Two years ago, their tent flooded on the second day, causing the macadam to need resurfacing and 10 gallons of water removed from their carpet. Another year, Adams remembered seeing parked cars sliding into each other because of how wet the ground had become. 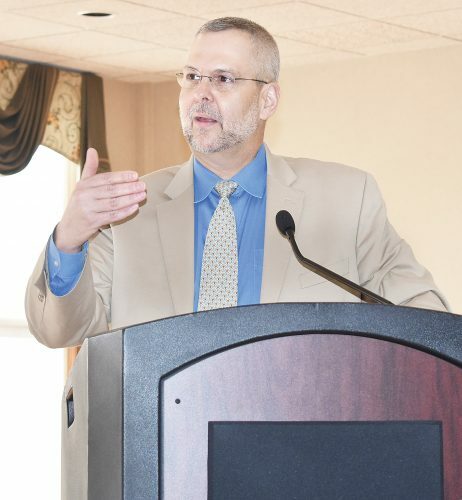 Despite the rainy days, Adams said he truly appreciates the Centre County Grange Fair versus other fairs because the entertainment is included with admission. He and Ethel fondly remember seeing acts such as Chubby Checker, Herman’s Hermits and a Bee-Jees tribute band and they looked forward to seeing Tracy Lawrence this year. Adams said he enjoys seeing his fair friends every year and eating Hewlett’s hot sausage sandwiches. He encourages people that have never experienced the fair to check it out for themselves. The Grange Fair runs from August 17 to 25 this year. More information is available at https://grangefair.com.